Granite Shield - Why Choose Granite Shield Over 15 Year Sealers? used to treat Stonemark, The Home Depot's branded natural stone product and also Everlife, Innovative Stone's own national brand. granites backed by a 15 year warranty. that protection is absolutely the strongest benefit beyond and question. rate and the "lifetime" coverage is not limited to a pre-determined service life that qualifies as lifetime. With Granite Shield "lifetime"
at any time and the use of ammonia glass cleaners and bleach based household cleansers all prove acceptable products for cleaning. coverage defined by their own words as "limited". customer and offering the coverage needed to deliver that performance in the event of an unexpected failure. coverage. 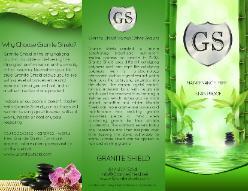 Granite Shield is revolutionizing the industry and are quickly becoming the "new stand" in treated surfaces. high jump by introducing their pre-treated programs, but today, Granite Shield has landed on the moon!" don't think you can do better than that." Michael Lamm was so impressed with Granite Shield Michael decided to become a Granite Shield applicator. etc. on the shielded stone, left it on for 24 hours and it wiped right off with a wet paper towel. Water beads on honed stone." for 25 years, after testing our sample I was speechless I have never seen anything work this good or come close. Thanks again." Granite Shield and it's permanent lifetime sealing process and our interaction with Granite Shield. client is pleased to the level of providing us not only with their estate home, but cabin & condo glass, floors & countertops as well. clock. A very genuine and candor approach. only sealing process that we endorse." Granite Shield. There was no stain and it's smooth and shiny like the day we sealed it with Granite Shield 3 years ago." found the Granite Shield website and am interested in the product. and how I can contact them." would come off, he said it's the sealer. Yuk. So, can you seal with your stuff OVER this and will it remove the film? Or is there a way to remove the film then seal with your stuff?" Granite Shield your granite will be smoother and shinier with a lifetime warranty." 1. 5 deep penetrating chemicals for permanent bonding protection. 2. Leaves granite the same natural color only a deeper penetrating shine. 3. 1 ounce or less of each chemical seals a 40 sq. ft. kitchen. 4. Granite Shield is a flameproof seal, heat will not affect Granite Shield. 8. No off-gassing and countertops are ready immediately for use. 10. Natural colors are preserved for a lifetime. stone cannot be restored to original state. 12. Warranty is backed by a multimillion dollar international company. 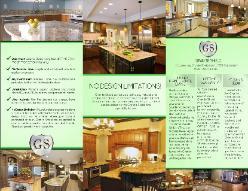 new or existing granite countertops. 14. Granite Shield doesn't leave a dull, hazy film. many Granite Shield competitors do. to glossy and honed granite. to any slab of your choice. Granite Shield will save you a lot of money. granite and has been a granite fabricator. the counter sealers that don't even have a warranty or don't even last 6 months to just get your sale. 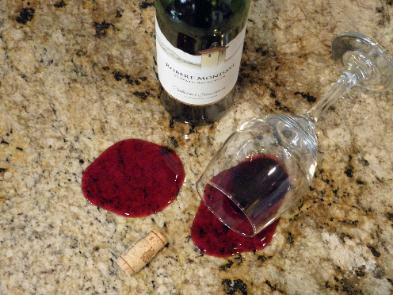 don't care if your granite stains and think it's just your problem. was still saying granite doesn't stain or just put butter all over your granite to make it the same all over. 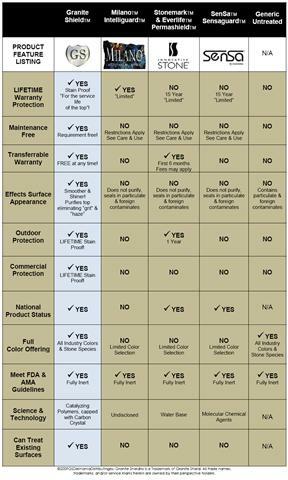 Why Granite Shield Permanent Lifetime Sealer? granite after being sealed with the Granite Shield process smoother, shinier and more sleek.